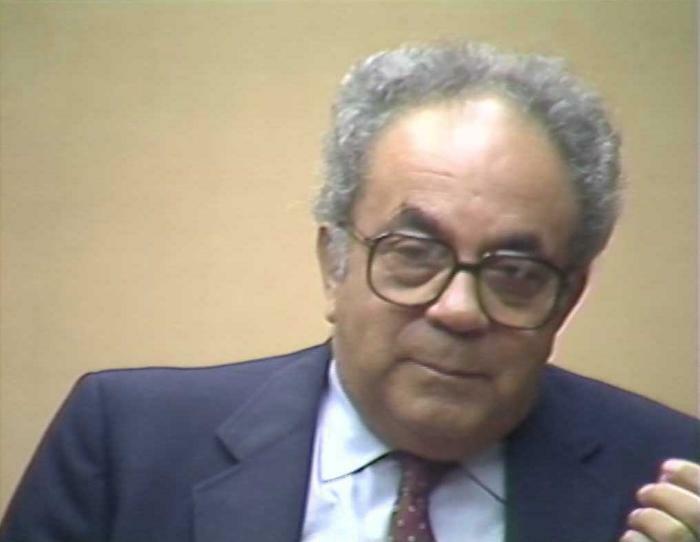 Still image from David S. Holocaust testimony, August 26, 1987. SynopsisDavid S. was born in Dubechne, Ukraine on May 15, 1923. He describes his family, his heritage and the Jewish community. He recalls attending public school then yeshiva. He describes antisemitic incidents. He recounts going to Lublin to live with his sister. David describes the German invasion. He recalls going to Włodawa where his brother resided and their decision to travel into the Soviet zone. He describes moving to Kovel and the conditions there. He describes deportation to a forced labour camp in Siberia. He describes the conditions and working in the kitchen. He recalls travelling and working in Kazakhstan and Uzbekistan. He describes returning to Poland in 1944 and learning the fate of his family. He discusses Sobibór camp near his hometown. He describes living in Lublin, Łódź, Berlin and then Munich after the war. He discusses emigration to Canada.